Our Open Barn program provides reduced admission for EBT, Medicaid, and Reduced/Free School Lunch letter or cardholders. As a part of this program, annual memberships for a family of five are also available for $20. Family memberships start at $50 for a family of two and are valid for one year. Membership benefits include unlimited visits, plus 10% off events, our farm shop, and Retreat Farm food trucks. Carlos, our iconic Brahma Red Holstein weighs around 2,300 pounds! He can be found up in the Piggery and loves being fed handfuls of hay. We have a female donkey named Sassy. Donkeys are used all around the world for many jobs. Despite their small size, they can carry people on their back and pull carts or plows. They can even be used to guard flocks of sheep or goats. Rabbits are often kept as pets, but are also raised on farms for meat and fiber. You can visit with our rabbits, but remember, as a prey animal, rabbits are naturally timid and shy! Goats are some of the most friendly and curious farm animals. Our herd is continuing to grow and we’ll have more kids (baby goats) throughout the spring season. We milk our does and the entire herd helps manage invasive plants on the farm. Visit with the goats inside the barn or admire the rest of the herd working and eating around the farm. Our sheep spend their nights out on pasture and days in the barn. Let them nibble corn out of your hand or help bring them up to pasture at the end of the day. We use their wool for workshops and if you visit us during Winter Carnival you can watch them being shorn! We have a rotating cast of new birds in the barn with new chicks arriving every three weeks during the summer! Visitors can hold the baby chicks in the barn and visit with our older birds in the Piggery. This season, we’ll have a variety of breeds including Wyandottes, Cochin Bantams, and Brahmas. We have a flock of approximately 30 Buff Orpingtons located near our Children’s Garden. These laying hens provide the eggs that we sell in our Farm Store. While you’re here, feel free to check for eggs in the laying boxes and bring down any you find to the store! There is a variety of birds roaming the farm including ducks, peafowl, guineafowl, and bantam chickens. They all help out by eating ticks and other insects. See if you can find them all as you explore the Farm. Our sows and piglets can be found in the barn. 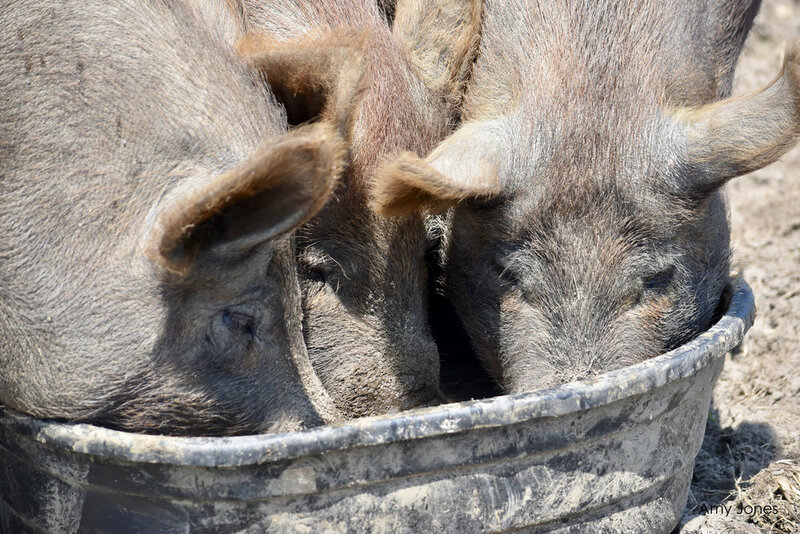 We use our pigs to till our gardens and help reduce our waste by eating food scraps from the farm and local restaurants. When they’re not napping, they love to get back scratches using wire brushes.